Ratan is widely regarded as a rare thought leader in the healthcare industry. It was a strong urge to make a difference in healthcare that led him to set up Medium Healthcare Consulting. At Medium, Ratan plays a pivotal role in shaping Medium’s philosophy with particular thrust on innovation, execution, and patient-centricity. He is personally involved in each and every engagement often setting up near-impossible internal benchmarks. His thought-provoking writings and talks on a wide variety of subjects continue to inspire many in the field. Earlier, Ratan was the CEO of Apollo Health and Lifestyle Limited, part of the Apollo Hospitals Group, for almost a decade. He created some of the most successful and innovative healthcare formats in the country such as a nationwide network of The Apollo Clinic and The Cradle, South Asia’s first boutique birthing centres. He also led the strategic marketing initiatives and international projects for the group. 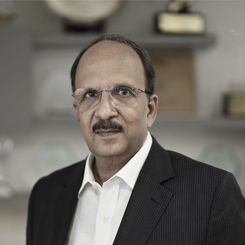 In 1996 Ratan, as President, set up India’s first hospital architecture and consulting firm Asian Health Services, a JV with ServiceMaster, then a Fortune 500 company. In a short span of three years, the firm became the undisputed leader in the field and had served leading organizations like Wockhardt Hospitals, Escorts Hospital, Max Healthcare, Aditya Birla Foundation, BLK Hospitals, IL&FS and Gleneagles Hospitals. He has over four decades of experience across diverse industries and functional responsibilities. He started his professional career in the information technology industry with HCL and then moved to advertising at Lintas (now Lowe). During his ten years there, he worked on leading Indian and international brands. Ratan was awarded the Marketing Impact of the Year Award by S P Jain Institute of Management, a leading business school in India. He was inducted into the Hall of Fame at the 2008 Franchise Awards for the success of The Apollo Clinic initiative. He is also a frequent speaker at leading management institutes such as Indian School of Business, IIMs, FMS, TISS, XLRI, IHMR and various industry forums such as CII, FICCI, ASSOCHAM, AIIMA and World Economic Forum. He was one of the few panelists invited from India to speak at the Harvard Business School Global Centennial Summit. He is an alumnus of IIT Kharagpur and Harvard Business School.